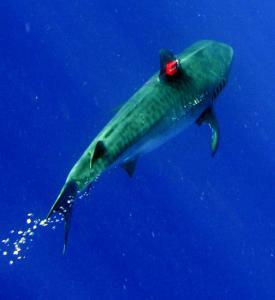 Tiger shark swimming with accelerometer attached to the dorsal fin (by C.Meyer), courtesy UH. 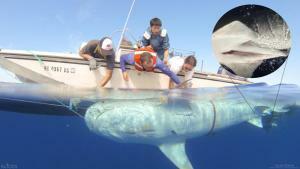 Scientists at the University of Hawai’i (UH) have shed new light on the hunting behavior of tiger sharks. A study of shark swimming dynamics off the west coast of Hawai’i Island allowed researchers to better understand why the tiger sharks yo-yo dive, repeatedly climbing and diving through the water while swimming. While previous studies documented yo-yo diving activity, the new study, researchers say, provides greater insight into the reasons for engaging in such behavior. 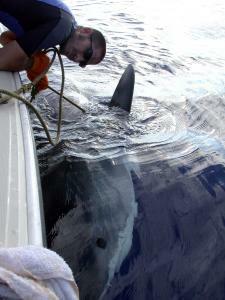 The new study links swimming events to the capture of prey during vertical movements. Scientists say the study allowed them to rule out energy conservation as primary reason for the behavior. Instead, the behavior is believed to be a hunting strategy as sharks comb large spaces for their prey. “These findings are exciting because they have given us unprecedented new insights into the behavior of these huge and difficult to study marine predators,” said Dr. Carl Meyer, a researcher at HIMB and the lead U.S. scientist of the project. 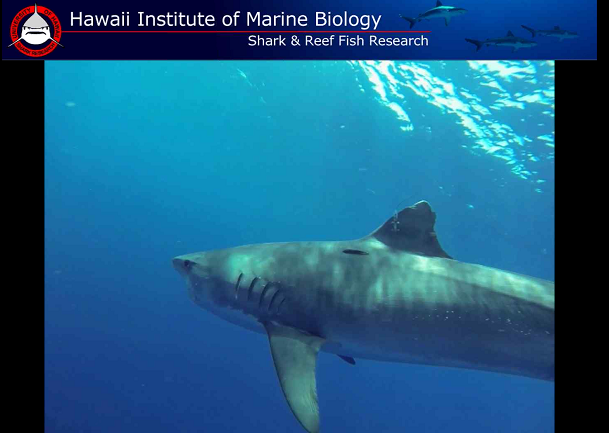 The research was conducted by the UH-Manoa Hawai’i Institute of Marine Biology (HIMB) in partnership with the University of Tokyo, the Japanese National Institute of Polar Research, and the University of Florida. Scientists were able to track the activity of tiger sharks by equipping four of them with high-resolution accelerometers and digital still cameras. While the cameras obtained images, the accelerometers were able to provide information on swim speed, depth, temperature and acceleration. *** Supporting information courtesy University of Hawai’i.